"...it's fantastic news for users, who can inject a bit of Apogee's pedigree into their work without needing to have a complete rethink on hardware, and who can look forward to an ever-growing collection of top-notch plug-ins." Apogee FX Rack Plugins are made with the same quest for quality and obsessive attention to detail as Apogee hardware products. Thanks to Apogee’s unique DualPath DSP-Native technology, Apogee FX Rack plugins can run both on the hardware DSP in Ensemble Thunderbolt and Element Series interfaces and as native plugins on your computer. The full suite is reviewed in the new issue of MusicTech magazine where they receive a 9 out of 10 rating and the magazine’s ‘Choice award. "Apogee's modelling is excellent, and is endorsed by the owners of the original Pultec designs." 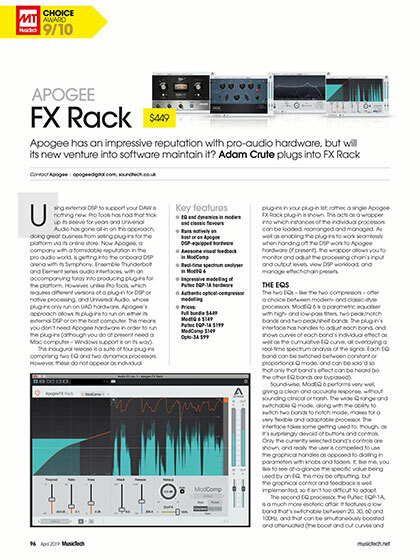 "There's no doubt that the FX Rack plug-ins are of a quality that matches and maintains Apogee's reputation and are well-chosen as initial releases. But what's really exciting about Apogee's venture into software is that it's open to all, not just those who've invested in Apogee hardware." The full review can be found in the April 2019 issue of MusicTech magazine on sale now. The Apogee FX Rack Bundle is available now priced at $449. Apogee is distributed in the UK/ROI by Sound Technology Ltd. For more information please call 01462 480000 or visit https://www.soundtech.co.uk/music-retail/apogee.